Felipe Anderson's fourth goal of the season was enough to earn West Ham a share of the spoils at Huddersfield's John Smith's Stadium this afternoon. The rejuvenated Brazilian struck with just 16 minutes of normal time remaining to cancel out Pritchard's 6th minute opener for ther hosts and earn Manuel Pellegrini's team a deserved share of the spoils. Arriving with optimism and hopes of their first back-to-back wins since January 2017, West Ham faced a Huddersfield side fresh off their first win of the season and riding their own fresh wave of confidence. The home fans had shaken off the nerves from their winless start to the season and, after a notably well-observed minute’s silence, their side responded with a determined and energetic opening period. The game opened like a highlights reel; frantic, frenzied and with both teams creating chances. And it was the home side who created first, with the oft-reliable ?ukasz Fabia?ski tipping a thunderous header against the bar after two minutes as Terriers’ striker Steve Mounié climbed above Balbuena to force a fantastic save from eight yards after meeting a corner. The tone was set from there, with West Ham charging up the other end and forcing their own corner only 14 seconds and three passes after the ball had left the crossbar ringing. A minute later, Diangana had set Arnautovic through on goal, the charging striker beating a high offside line and reaching the penalty area, before his curling effort was stopped well at the near post by the Huddersfield ‘keeper. The breathless start looked to suit Huddersfield more, and it was they who opened the scoring. Diop flicked a pass forward to a retreating Anderson, but the Brazilian’s fired pass put Rice in trouble and he was dispossessed quickly. The impressive Pritchard managed to work the ball into somewhat of a shooting space, and it was from just outside the box that a tame shot squeezed through the legs of Rice, flicking off his heel enough to completely outfox a scurrying Fabia?ski before rolling into the bottom corner. 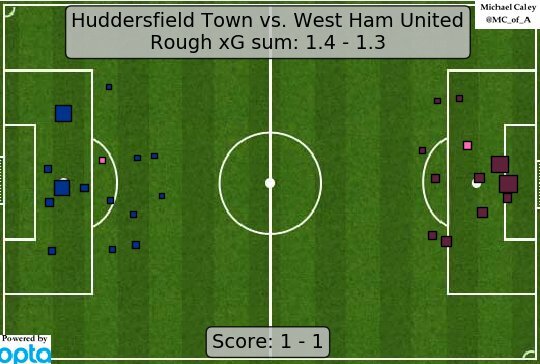 Huddersfield were the more dominant from there onwards, attacking in numbers and pressing in packs when West Ham got the ball. In a midfield battle, the home side were taking control. The Hammers created little as the half went on, with flashes of pace and direct running between Anderson and Arnautovic flattering to deceive. It was the home side who would feel aggrieved not to go into half-time further ahead. First the impressive Billings saw a cross from wide fly over Fabia?ski’s flailing dive and against the inside of the West Ham post. Not long after, Diop’s indecisive passing from the back was again pounced upon, but the Irons were lucky that Mounié finished like a man who is yet to score this season. It had been an open half in a game with two teams who played on the front foot throughout. After the break, Pellegrini looked to spark life into West Ham by using the bench. Javier Hernandez came on for Diangana, moving Snodgrass wide and Arnautovic into a number 10 role. The Mexican nearly scored out of nothing after only two minutes on the pitch. A tackle from Obiang fell into the box, which sparked Hernandez into life. Twisting and turning, he couldn’t get the ball to sit for a shot, but somehow managed to loop a bouncing ball just over the bar with a desperate header. It was a start that gave the visitors confidence. West Ham were stronger in the second half, less rushed, more in charge of their own game. Yet it appeared for some time that an inability to create chances could prove problematic for the Hammers again this season. Pellegrini rolled the dice, throwing on Antonio and Fredericks. With attacking numbers on, it was Felipe Anderson who unlocked the door. First he beat three men down the left, once with skill and a second time with a lovely pass that fed Robert Snodgrass into the box. His floated cross fell across the area to Arnautovic, who fluffed his volley to Hernandez just outside the six yard box. His shot was blocked by one of four approaching Huddersfield players, Antonio swivelled on the rebound before firing against another defender. But the ball fell once more to the feet of a West Ham man, and for the third time in two games, Felipe Anderson fired the ball home and gave West Ham their equaliser, his left foot drive beating the 8 men between him and the goal, nestling into the top corner. Both teams sensed a winner was there to be had. End-to-end it went again. Diop rose to meet a corner but saw his effort headed off the line, Huddersfield came close from range. West Ham, having used all three substitutions, were left with ten men as Ryan Fredericks was forced to watch from a standing position with what now appears to be an ankle ligament injury. It was with 30 seconds remaining that Huddersfield missed a final gilt-edged chance, completely missing the ball on a volley six yards out, and a very even game was left with the points shared. The Hammers will search again for their first back-to-back wins since January 2017. It’s three wins from 12 games this season with a visit from the Champions Manchester City coming after the international break. Flat or wrong-footed for the goal, he should've made more of a fist of it. Attoned later with a couple of good stops but was saved from embarrassment later on by a post, after a mis-hit cross eluded him. Not as forward-minded as against Burnley last week but still defended ably. Like one or two others, is yet to match his peak performances of a couple of seaons back. Possibly his least effective performance yet in a West Ham shirt - although the bar has been set extremely high. Calm and assured, as he is making a habit of being. Given little chance to shine today due to the close and urgent attention of Huddersfield's midfield. Possibly a tad fortunate not to concede a potentially silly penalty but was nontheless particularly disappointed at being replaced. Should've had an assist to his name after just three minutes but Marko couldn't convert a perfectly-timed through ball. Little chancec to shine thereafter and replaced as Pellegrini looked to shape things up. Not his day - which happens as a striker. He'll know he should've found the net when presented with a golden opportunity; perhaps it arrived a little too early, to Huddersfield's benefit. (Replaced Zabaleta) Produced an effective performance when required to replace his stricken team mate, although it looked briefly late on as if he'd be forced to withdraw through injury (to his credit, he continued to play out the game). (Replaced Obiang) It was once often suggested that goalkeeper Mervyn Day lost his spark upon getting married. Exactly what Antonio's reason is remains unclear, but if anyone finds his mojo could you please return it immediately. Lukasz Fabianski, Pablo Zabaleta, Aaron Cresswell, Issa Diop, Fabian Balbuena, Declan Rice, Pedro Obiang, Felipe Anderson, Robert Snodgrass, Grady Diangana, Marko Arnautovic. Goals: Felipe Anderson 74 . Lossl, Zanka, Schindler, Kongolo, Hadergjonaj, Mooy, Hogg, Billing, Lowe (Durm 45+1), Pritchard (Mbenza 72), Mounie (Depoitre 90). Subs not used: Hamer, Smith, Bacuna, Kachunga.